Chef Tiger's Kitchen: Christmas Cracker Fun! I had an absolutely wonderful time opening up my 2 of the 3 to be recieved Christmas Crackers. My first one was from Linda M. Who spoiled me absolutely rotten and I loved every second of it! Here's the before pic! 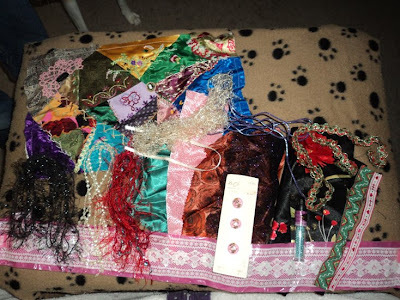 I first opened the little box parcel and found a container that the cover had a little CQed finished piece on it and inside was a wonder selection of tatting motifs.!! I absolutely love tattying but have not time to learn the craft myself so I'm thrilled with having a selection to use in my own CQing. Then came the hand dyed silk ribbons. I have just started using silk ribbon myself have but 3 colours in my stash... til now! They even came with some printed bobbins to wrap the ribbons one!. .... then came chocolate!! 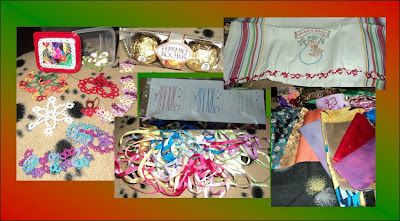 ... a beautiful tea towel with tatting on the edge and a a stitched snowman on it... and fabrics... and all this before the cracker was even opened! Here's a collage of the pictures of the packages. 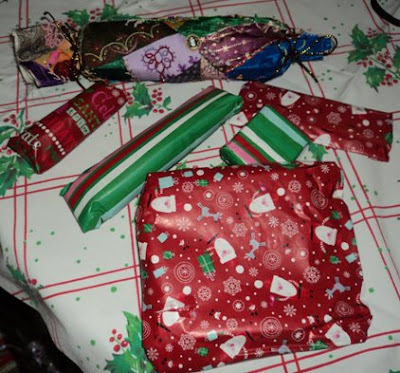 Here's a pic of all the goodies found inside the cracker! oohhh the fun I will have finding places to use all these wonderful goodies. 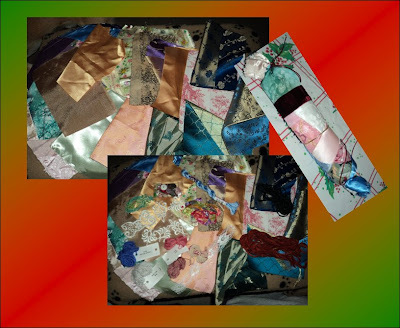 Then came the cracker from Ely A. I LOVE the double sided fabrics and I'm looking forward to using these pieces and utilizing both sides of the fabric! There was lots of goodies inside too. A little baggies of buttons and beads... the flower shaped beads I've seen before and wanted but held off on getting any. Now I have some! And the best part is I still have one more to come in!! Glad you like your goodies!!! Looking forward to seeing CQ blocks. Happy New Year! !